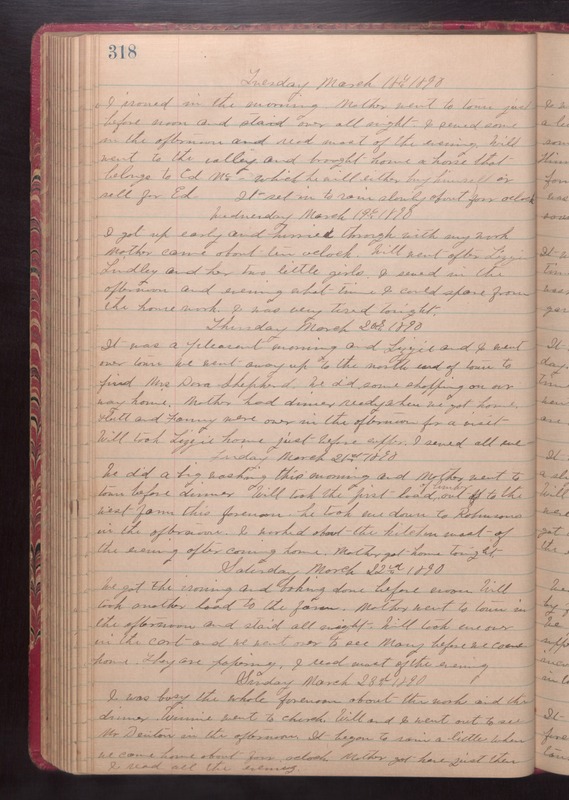 Tuesday March 18th 1890 I ironed in the morning Mother went to town just before noon and staid over all night. I sewed some in the afternoon and read most of the evening. Will went to the valley and brought home a horse that belongs to Ed Mc. which he will either buy himself or sell for Ed. It set in to rain slowly about four oclock. Wednesday March 19th 1890 I got up early and hurried through with any work Mother came about ten oclock. Will went after Lizzie Lindley and her two little girls. I sewed in the afternoon and evening what time I could spare from the housework. I was very tired tonight. Thursday March 20th 1890 It was a pleasant morning and Lizzie and I went over town we went away up to the north end of town to find Mrs. Dora Shepherd. We did some shopping on our way home. Mother had dinner ready when we got home. Hutt and Fanny were over in the afternoon for a visit Will took LIzzie home just before supper. I sewed all eve. Friday March 21st 1890 We did a big washing this morning and Mother went to town before dinner. Will took the first load of lumber out to the west farm this forenoon. He took me down to Robinsons in the afternoon. I worked about the kitchen most of the evening after coming home. Mother got home tonight. Saturday March 22nd 1890 We got the ironing and baking done before noon Will took another load to the farm. Mother went to town in the afternoon and staid all night. Will took me over in the cart and we went over to see Mary before we came home. They are [papering?]. I read most of the evening. Sunday March 23rd 1890 I was busy the whole forenoon about the work and the dinner. Winnie went to church. Will and I went out to see Mr. Denton in the afternoon. It began to rain a little when we came home about four oclock Mother got here just then. I read all the evening.